Small kitchen updates that are sure to make a big impact! Are you interested in remodeling your kitchen? Intrigued by the idea, but unsure of the scale of the project? Well, consider some small kitchen updates for your remodel that will make a big impact. Learn more about what these small changes are and how Kitchen & Bath Depot can make them a reality in your home! Create The Perfect Space With Our Top Three Kitchen Updates! Consider Installing a Backsplash – The first small change for kitchen remodeling you can make is installing a backsplash. What does a backsplash do? Backsplashes help protect your walls from water splashing around while cleaning up or cooking or from grease splashing around while cooking. Enjoy your scrumptious meals with some peace of mind that there will be less mess left behind when you’re done. 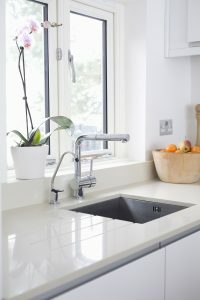 Proceed with Upgrades for Faucets and Sinks – The second change you might want to make in terms of kitchen remodeling is the upgrades – your faucets and sinks will likely need to be upgraded for both style and function in your new space. Like the other changes we suggest, their effects may not be readily apparent, but a new sink made of stainless steel or copper can spruce up your kitchen. Getting a new sink also means you can make it deeper. A deeper sink has more capacity, which will make chores around the kitchen much easier to accomplish. Refresh Your Cabinets – The third update necessary for the perfect remodel is to refresh your cabinets. You won’t need a total replacement, but as with faucets and sinks, consider investing in some upgrades. Upgrading and refreshing your cabinets could be a simple as adding some new knobs. With this method, you can add some fascinating details to your cabinets. Want to reflect a modern, rustic, or traditional style? Refreshing your cabinets can help get you there. This entry was posted on Wednesday, April 12th, 2017 at 12:26 pm. Both comments and pings are currently closed.